With the streets dotted with busy cafés, with the boulevards and city parks alive with unhurried flâneurs, Paris in the 19th century was an immense outdoor living-room where all classes mixed freely. But what homes did they return to when the day was over? To be sure, the wealthiest headed for their mansions called hôtels privés – not to be confused with a real hotel – while the rest, from the well-to-do to the poorest citizens, lived atop each other in mostly six-storied houses. To better understand this class arrangement, view the picture in the post Living Vertically. 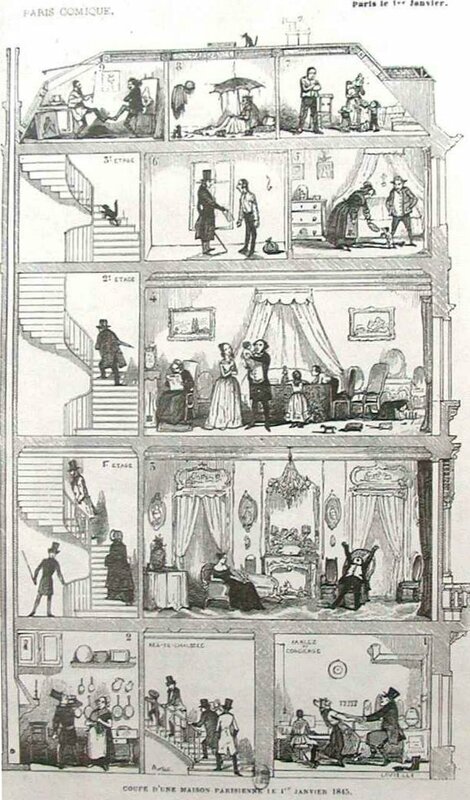 The illustration you saw above represents a sitting room of the privileged inhabitants found on the second floor just above the street level and the entresol, both occupied by shops and offices. The rooms on this floor were spacious, the ornate ceilings higher than those on the floors above, the walls and doors treated with elaborate decoration. The large French windows usually lead to a balcony. They provided plentiful light and fresh air in the summer and unpleasant cold drafts in the winter. The only source of heat was the fireplace, where the fire consumed expensive wood logs (coal was not frequently used in Paris) and even the most affluent Parisians occasionally suffered from cold. In the following picture, we are in a cozy, but reduced dwelling, probably situated on one of the upper floors. A card reader conducts her profitable business in her bedsitter. Notice the old-fashioned built-in bed. If the bed is somewhat shorter than normal, it is for a reason. In the past, Frenchmen used to sleep in a reclining position to ease breathing. The niche in which the bed was inserted was called alcôve and to this day the expression les secrets d’alcôve refers to seduction, adultery, and other spicy activities in the bedroom. A lower-class room, like the one below, would be home to a skilled worker or a small shopkeeper. 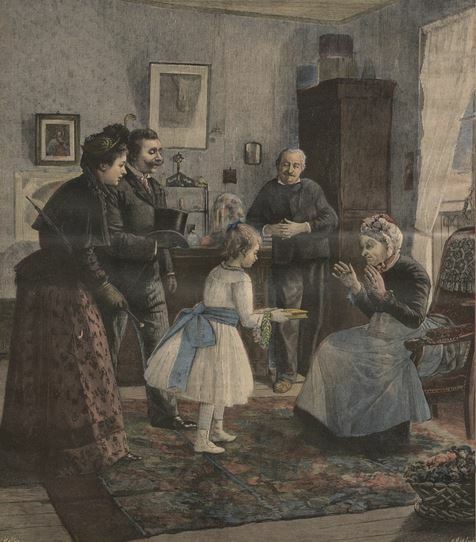 A young family, in their Sunday best, are visiting aged parents. The son has done well, he is probably a white-collar, or the daughter has married wisely. The old couple is decidedly working-class. There are signs of mild comfort: a small carpet on the floor, some pictures hanging on the wall, and cheap knick-knacks on the dresser. The last floor, directly under the roof, was reserved for the poor. It was home to the servants of the house, or—worse—to the near destitute as long as they could afford rent. 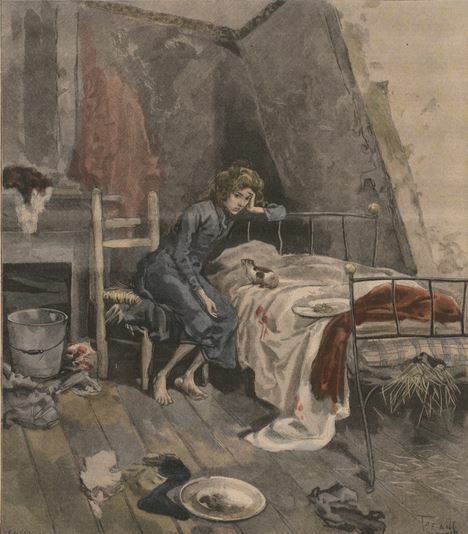 The illustration below is a picture of utter misery, but life under the roof was not comfortable in the best of cases. In the old houses, water had to be carried up from the courtyard and in the newer buildings the taps ended on the fourth floor because there was no sufficient pressure in the pipes. There was no heating; a portable stove on which a stew would be cooked, was rarely used as fuel was too expensive. Cooked food came cheaper when purchased from the street vendors. The following text was written by James Jackson Jarves (1818–1888). This American newspaper editor and art critic visited Paris in the early 1850’s and published his impressions in Parisian Sights and French Principles, seen through American spectacles (1852). His humor and the clarity of his writing vividly portray the living conditions in mid-century Paris. In a city where revolutions have become as periodical and necessary as measles, chicken-pox, and the whooping-cough to childhood, this species of architectural communism is very far from being a social one. No one knows his neighbor. There is no door-plate on the several landings, to satisfy curiosity as to who is to be found within. Somehow or other, the occupants never seem to meet on the common stairway. Of the seven families beside my own that occupied No. — of Rue de Foix six months, I knew nothing except that one was English, and another Russian. I could not have distinguished a single member of them all from a casual visitor. It is said that two friends lived for a year in the same house without being aware of the fact, until they accidentally met in the street, and inquired each other’s address. The apartments usually taken by strangers, for limited periods, are let furnished with every necessary for housekeeping, except linen and silver, which are hired separately. Inventories are taken on entering and leaving; the lodger being responsible for all damage, other than ordinary wear and tear. These inventories embrace a list of existing damages, including grease and other spots on carpets, table-cloths, cracks or fractures in the glass or porcelain, all minutely detailed, as well as injuries to the furniture, &c. If any are added, they are to be paid for according to the tariff of the landlord, which is not of the most liberal character. French kitchens are more like a ship’s caboose in size, than the domains of an American cook. What room there is, is mainly occupied by numerous little grates, raised upon a brick platform, and adapted in size to the various copper, “casseroles,” or saucepans, so necessary for the preparation of the indispensable “entremets,” of French cookery. A Yankee cook would be as much at a loss in one of these kitchens, as she would over a locomotive. One half of the ingenuities of our American furnishing warehouses would be equally as inexplicable to a French housekeeper. A good broom is not to be found in Paris. 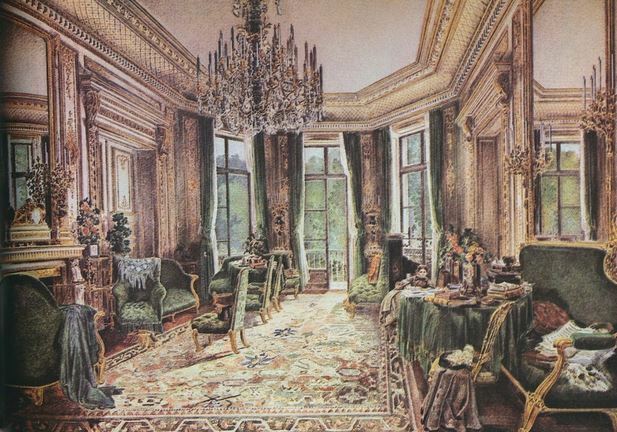 Carpets have been introduced into the apartments rented to English and Americans, but the French make but comparatively little use of them, preferring the waxed oak floors, which are cooler and cleaner, but require no little care, at first, for a stranger to preserve his equilibrium. The French use much less fuel than we, warming themselves more by extra clothing and foot-muffs, than by fires. The search for apartments, which to a novice is a matter of amusement, soon becomes a fatiguing and embarrassing employment. He is ushered without ceremony into any which are taken for a short time, without regard to the convenience of the occupiers; led through disordered bedrooms, unarranged cabinets, and ushered into all the privacy of family matters, lucky for his and their modesty, if among the scattered articles of toilet, he does not pounce upon some fair one in matitutinal dishabille. At first, I hesitated upon these domestic thresholds, but the unceremonious “Enter, Sir,” soon convinced me that the right of the landlord to exhibit his apartments was superior to any considerations of delicacy. 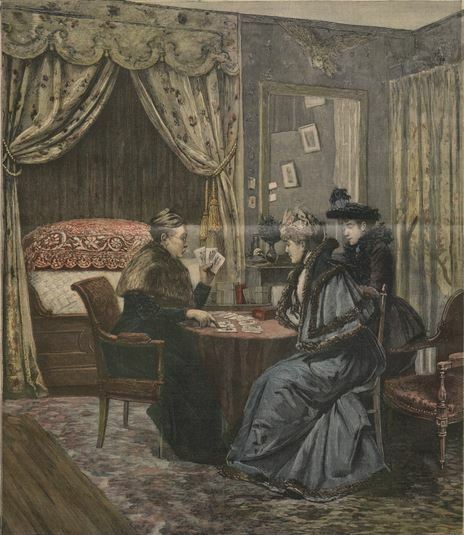 It was amusing to contrast the coolness and indifference with which French tenants underwent this scrutiny, often saying a word in favor of the lodgings or landlord, and always frankly courteous; whereas, with English or Americans, one was evidently looked upon as an intruder into their temporary castles, from room to room of which the ladies — like quails seeking cover — dodged about, to avoid meeting a man more frightened than they were themselves. Investigations in the unoccupied apartments are of course pursued under more favorable auspices. But, to believe the assiduous porters, there was not one that had a single fault, or wanted a single comfort, or even luxury. All of any pretensions had just been vacated by Russian princesses, or English “milords.” One proprietor, after a pompous eulogium on the merits of a spacious apartment, whose faded gilt furniture and tawdry splendor, seemed to have descended untouched and almost undusted, from the days of Louis XV., said, as a climax, “The Princess has just been to look at them, and was perfectly charmed; she wished to take them at once.” “Pray why did you not secure so noble a tenant?” ” Because she could not deposit the-required security for rent,” was the reply. Having just seen in the paper the arrest by the police of a Greek prince, for forgery, I came to the conclusion that the title “prince” was no better security for contracts or morals in Europe, than “colonel,” in the United States. After ascending and descending, in the course of a month, perhaps a thousand pair of slippery stairs, and repeating the same questions, the lodging hunter growing desperate, affixes his signature to a paper, promising to pay from 100 f. to 1200 f. per month, in advance. In consideration of this sum, he finds himself, in one case out of two, in the possession of an apartment, in the inventory of which no mention had been made of smoky chimneys, and various facilities for the circulation of cold air, or odors which savor not of Araby the Blest, but which have now become his heritage for the period stipulated in the contract. 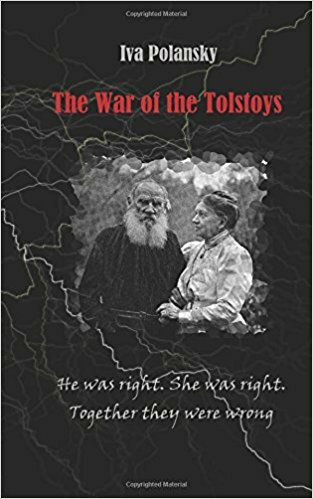 The different manner, in which the Anglo-American and the Gaul build their family nests, is pointedly brought home to the former the night of his arrival at Paris. We live in perpendicular strata; they in horizontal. Our houses stand side by side, each like a tub on its own bottom. Theirs, so far as they relate to families, are spread one upon the other, like a pile of gingerbread. With the exception of the principal hotels, and a few recently constructed in the English mode, Parisian houses are arranged after the following fashion. In general, they form a hollow square, allowing a court-yard of sufficient size for a carriage to turn. This shape admits of two ranges of apartments, equivalent in accommodations to houses with us; the one facing the street, the other the court-yard, the kitchen and other conveniences being the two connecting arms. Houses thus constructed accommodate two families on each floor, and are from five to nine stories high. The ground floor is devoted to shops, stables, and he porter’s quarters. It is entered by a huge “porte cochère,” which is always guarded by the family of the concierge, who acts as agent for the proprietors in letting their apartments, and watches all the outgoings and incomings of the mansion. Each range has its wide circular staircase for the gentry, leading as high up as what was once considered the only abode of genius, and another — small, dark, and narrow, like the worm of a ram rod — for the use of domestics. The porter must be on the ” qui vive” at all hours of the twenty-four, to slip back the bolt of the outer door, by means of a string connecting with his office, upon the warning ring or cry, ” Le cordon, s’il vous plait.” Those who enter after midnight, bestow a trifling gratuity upon this Argus, to compensate him for his disturbed slumbers. He replies to all questions relating to his charge, pays postages, receives and distributes all letters and parcels that have owners within his domain, uses your fuel as if it were his own, and is always ready to do the amiable — for a consideration. The floor above the entrance is called the “entresol,” being, as its name indicates, between sun and earth, and it is generally inaccessible to the former, at any season of the year, except in the widest streets or avenues. Being low, it rents low, compared with the floor above, which forms the apartment Number 1, in height, finish, and decoration, and is, consequently, much the dearest. They then progressively decline in price each story, and also in quality, until they terminate under the roof in a series of little chambers, for the servants of the mansion, two or more of these rooms belonging to each apartment. The apartments themselves are of every variety and size, to meet the wants of the diversified positions of the inhabitants of this metropolis. Some are of sufficient grandeur and sumptuousness to rival the interior of the more pretending hotels, while others dwindle to the means of the most economical bachelor or money-saving grisette. This mode of building has some prominent advantages over ours. Externally the houses are more uniform, of greater size, and being built of a soft gray sandstone, admit of more architectural ornament. They economize also in ground-room and material, consequently in rent. All the rooms of a family being only one floor, much of that stair work of which our ladies complain, is saved. In enumerating these advantages, I have enumerated all, unless it may be considered one to be able to bring together the different branches of a family under one roof. Their disadvantages are more palpable. Each floor having its separate kitchen and drains, contributes its quota to an assemblage of odors, based upon the fragrance of shops or stables beneath, which, in spite of locks and bolts, penetrate with an impartial distribution into every room. This nuisance is not always perceptible, but it is a daily liability; and the plain truth is, that there are few of these gregarious habitations that do not give offense to sensitive nostrils more than once during every twenty-four hours. This fact has doubtless some relation to the enormous consumption of perfumery, which, not infrequently in the street, overpowers all other smells, as the scented individual goes by. Again, no amount of cleanliness in one story can always be proof against a want of neatness in the next. If one family cooks onions, the neighbors above and below are brought into unmistakable cognizance of the fact. If there be a frolic overhead, the family beneath participate in the noise, without the fun. 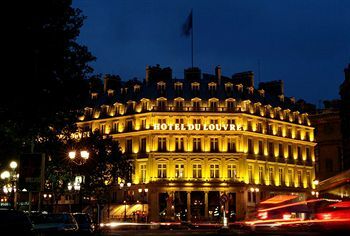 “The summer and autumn are the seasons one should spend in Paris, to see it in its full glory. 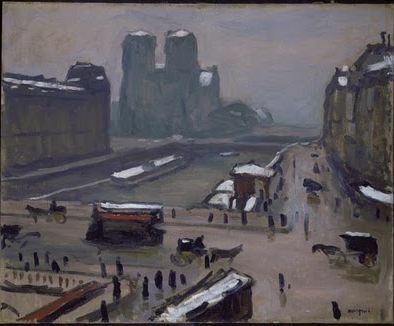 The people of Paris live out-of-doors, and to see them in the winter, is not to know them thoroughly. The summer weather is unlike that of London. The air is pure, the sky serene, and the whole city is full of gardens and promenades. The little out-of-door theaters reap harvests of money–the tricksters, the conjurors, the street fiddlers, and all sorts of men who get their subsistence by furnishing the people with cheap amusements, are in high spirits, for in these seasons they can drive a fine business. Not so in the winter. Then they are obliged either to wander over the half-deserted places, gathering here and there a sou, or shut themselves up in their garret or cellar apartments, and live upon their summer gains. If you entered through the double door of the carriage entrance that lead through the front portion of the apartment building to the courtyard and somewhere, usually tucked near the steps, you found a cramped dwelling illuminated by the second-rate light of the vestibule. In this badly-ventilated cubicle there lived the Parisian Concierge. Although considered the lowest of the low on the social scale, she wielded a considerable power over the tenants. The concierge loge was the hub of a spider’s net, its threads reached not only into every apartment in the building but extending out in the street. The tenants were well-advised to remain on her good side. Failing that, their mail could go astray, and their reputation be tarnished by malicious gossip through the neighborhood. Her eagle-eye noticed all the comings and goings, especially past ten o’clock in the evening, when the main door was locked and late comers must ring the bell. Unavoidable as well as indispensable, she supplemented her meager wages by performing all kind of services for the tenants and often pocketed bribes for keeping secrets. To be at the mercy of a coarse uneducated woman necessarily created resentment. No creature has been more mocked and maligned in literature. 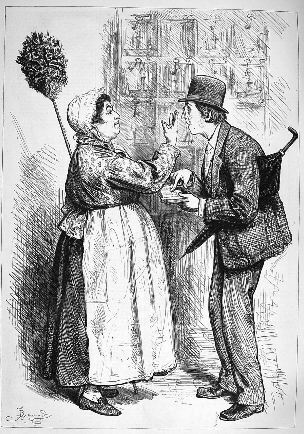 Caricatures of the era picture her as a repulsive harridan, either sickeningly self-ingratiating or loftily dismissive, depending on the importance of the tenant. The repulsive solitary old woman was of course a cliché. The post was often filled by a middle-aged couple. Since the only financial advantage was a free lodging and one per cent of the rental income, the husband had to have an outside job. Scarcely visible, he remained in the shade of the concierge lore.